my alarm went off early as I wanted to get up early and crush some miles. but instead I switched it off. Finally emerging at 6.30. but I was slow it took me ages to strip down and pack up, so it was 8 am before my feet bit the trail. As I walked several clean smelling hikers passed me by going South. They must be up early I thought. I pushed on amazed how nice the trail was and then debated to myself if I should have gone on last night. No, I did the right thing. In the Shenandoah national park, the signposts are concrete blocks with the directions etched into aluminium bands. so, I must look closely to see which direction I should be heading. the marker post taking me the shelter was .2 miles to the east (my right). I followed the blue blazes down the trail. Until the shelter came into view. I expected it to be empty but there was some one here. Her name was Sierra which I really liked she was a veterinary nurse. we chatted for a while before I went and got water. It was a piped spring and so u didn’t filter. I topped up.my bladder and gulped down a litre. Sierra went and got water but as she filtered water leaked everywhere. I explained that she had possibly over tightened the connection. wrecking the “O” ring I suggested giving the. Company a call and get a replacement. I would have liked to have hiked with her, but she was only out for the weekend and was getting picked up by a shuttle later to go home and back to work. I said my goodbyes and retraced my steps back up towards the trail. The next few miles were up as I made my way up Black mountain, but as I neared the top it began to get busy with tourists and their dogs. I flowed the trail around the mountain taking in the amazing views. and chatting to the day-trippers. I spent the next four of hours going in and out of the forest crossing backwards and forwards over the same road as I climbed. I was making good time and was looking good to get lunch at the loft wayside. I was busy pushing when I spotted it …. A bear a great big bloody huge bear. I slowly got out my camera and began to shoot. he saw me. he looked at me he totally ignored me. omg I saw a bear. I was so so excited. omg that has made my day. A round the next corner was a fawn and mum. they walked down the trail before bolting off into the woods. 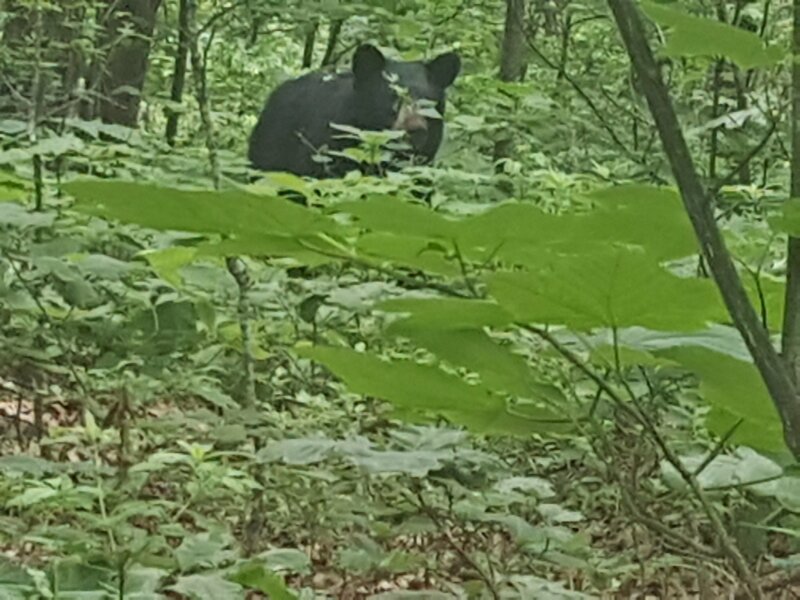 but hey I’ve seen my first bear and rather close too. Soon I came to the trail that took me down to the wayside (cafe and gift shop) it took about 20 minutes down this side trail. after I finished my plate I pottered around the gift store. I sat outside to write my cards, but I had no cell service so couldn’t pull the addresses. Bumblebee then asked where I was heading. well if like to reach the 900 then crash I said. They had planned on doing the same. I brought I more coke that I promptly drank then I was away. back up the side trail and then back to the trail. it was just 1pm when I re-joined the trail. the next shelter was 4 miles away, but I wanted the next one that was 12 miles. It was doable. but I’m a friendly chap and when people talk to me I chat back and so I lost about an hour. plus, some big climbs and the target became unrealistic unless I pushed on late. I knew that I needed to get water here from. The rangers station. so, followed the road until I reached the building. There was a tap. I filled up.my bottles then frank one so filled it up again. I walked back up. The road and re-joined the trail I hadn’t gone far when I spotted Bumblebee setting up. Her tent. Nice spot I said. and carried on but I was tired. after almost 40 minutes of walking I spotted a place that may do.